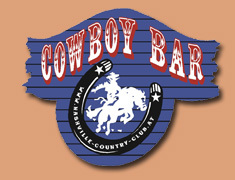 Here you will find some informations about the Nashville Country Club and the "CowboyBar". Every month we organize a meeting in a local eventcenter in Innsbruck. Then a usually unadorned hall gets changed into a country- and westernbar. It takes 2 whole days for decoration to create the right atmosphere. Afterwards 2 bars, a hall with stage and 130 seats are at our visitors disposal. Bands from Europe and the USA take care of the right mood all night long. The next morning everything has to be changed back to normal so that it seems the event never happend. we will help you with tips and infos.